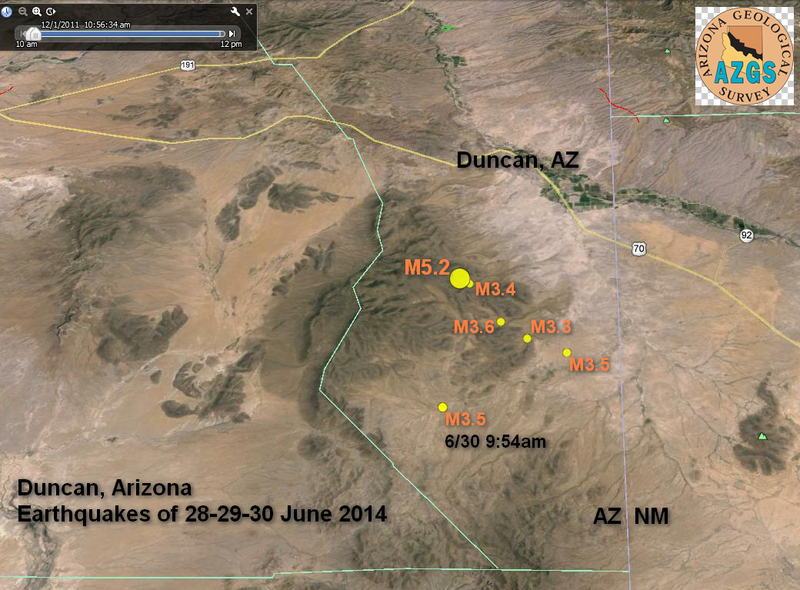 We have recorded more than 110 aftershocks since Saturday night's M5.3 earthquake near Duncan in southeastern Arizona. Dr. Jeri Young, who manages the Arizona Integrated Seismic Network at AZSG, says all but five are below magnitude 3. The USGS interactive map shows events larger than 3.0 [right]. It is unlikely that any of the quakes smaller than M3 would be felt even by people near the epicenter. Jeri says the network detected ~70 aftershocks in the 24 hours after the main shock, 36-38 in the second 24 hours, and 3 more since then. We expect aftershocks to continue to occur for weeks and possibly months.